WORLD FAIR TRADE DAY IS COMING! World Fair Trade Day is the largest Fair Trade event in North America. Communities around the country are celebrating between May 1 - May 14th, and culminating on Saturday the 14th. As a certified Fair Trade and Fair for Life company, the concept of fair trade is intrinsic to Theo Chocolate. And yet, we recognize that most consumers are not as steeped in the concept of fair trade as we are. For this reason, we welcome every opportunity to share the fair trade concepts of social responsibility, promotion of fair wages and good working conditions and protection of human rights. We are committed to educating consumers and celebrating our mission and vision alongside our partners in the Fair Trade movement. We have already heard from Maria Louzon, who organized a World Fair Trade Day at the end of April on the University of Maryland Campus. Students sampled Fair Trade products and talked about their impressions. Louzon said "This really made me feel a sense of accomplishment because I wanted students to start a dialogue with others about Fair Trade at the event and this definitely happened more than once!" 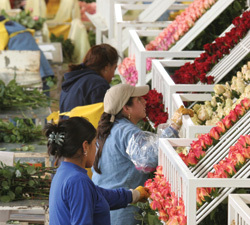 In 2009, over 65,000 people took a "Fair Trade Break" by purchasing only fair trade certified products between May 1 - 14. This year, organizers are trying to increase that number to 100,000 participants! In another show of support, Theo will offer 10% off all Theo merchandise in our own retail store on May 14th. We are committed to continuing to promote the fair trade cause through our own products and educational mission, and to finding creative ways to help you join the movement! Don’t forget to take a Fair Trade break of your own between May 1 -14, and remember, the choices you make as a consumer matter every single day! The United Students for Fair Trade Convergence took place in Seattle a couple weeks ago. Theo Chocolate was very proud to host many of the producers here at the factory for a special tour. The participants were here from as far away as Uganda, Mexico, Nicaragua and one of our very own suppliers, Juanita Baltodano Vilchez, was here from Costa Rica. With the help of multiple translators we had a very spirited conversation about the complex processes of getting raw materials from the farm to the grocery store shelves and consumers. I think everyone emerged from the discussion with heightened respect for all members of the supply chain. You can read more about Juanita & Theo Chocolate on the Whole Foods blog. Read her post here. Invisible Voices on the subject here. There is a serious side to what Fair Traders do and why they do it. If you are not moved by the plight of third world farmers and don't see the Fair Trade Premium as worth the cost, consider these moving stories of children in Ivory Coast. Ivory Coast is located on the southern coast of West Africa. Its exports include: cocoa, gold, rubber, palm oil, coffee, and tropical woods. 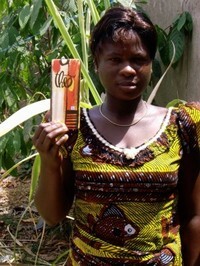 The cocoa trade drives one-third of Ivory Coast’s economy. 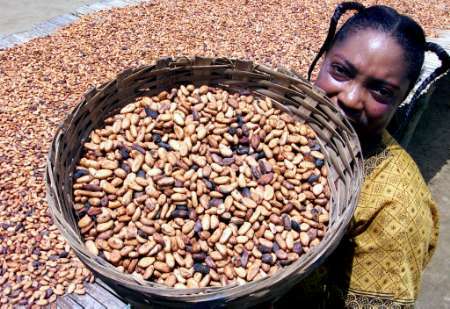 Ivory Coast provides 43 percent of the world’s cocoa beans. Ivory Coast is the top grower of world’s cocoa beans: 1,290,000 during the 1999-2000 growing season. There are approximately 600,000 cocoa farms in Ivory Coast. Ivory Coast is the world’s fourth-largest Robusta coffee grower (after Vietnam, Indonesia, and Uganda). Coffee and cocoa crops are often grown together, so the taller cocoa trees can shade the coffee bushes. On some farms, the same workers harvest both crops. Here is a partial list of Fair Trade Certified Cooperatives courtesy of TransfairUSA, including Kavokiva in Ivory Coast and Kuapa Kokoo in neighboring Ghana. Bambootique Trunkshow in Tualatin - Free Chocolate! Beth and Tammy of Bambootique are hosting a Spring Trunk Sale Saturday May 3rd from 10am-4pm - which is wonderful in and of itself, but what's more, they are offering a free Theo chocolate bar to every new customer! Yummeh. Shopping a Sale + Fair Trade + Free Chocolate = PERFECT SATURDAY! Please contact Beth to be added to the mailing list and receive directions to the sale. Our Reverse Trick or Treat was a grand success, and we loved having the opportunity to spread the word about Fair Trade and surprise and delight moms and dads with a little more "Treat" in return for their Halloween generosity this year. Our "kids in the field" reported that parents were completely taken aback at the reverse gifting, and responded enthusiastically to the Fair Trade message. Big thanks go out to Global Exchange for spearheading this amazing movement, and the Washington Fair Trade Coalition for their support (Thanks Stephanie!) We can't wait to participate again next year and reach out to even more people. Thanks to everyone who participated near and far, and all the bloggers out there spreading the good word.